Our onsite work station assessments and training are delivered by qualified osteopaths and physiotherapists with extensive knowledge of HSE legislation. All of our DSE trainers are also qualified osteopaths or physiotherapists, with experience in treating a range of musculoskeletal conditions and work-related injuries. They are able to draw upon this vast experience in order to best provide advice and training to safeguard your employees from Workstation & DSE related issues. 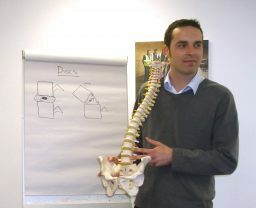 Our OFI training consultants use everyday, easy to understand language to give delegates an appreciation of the anatomy and physiology of the back and upper limbs and how and why injuries occur. DSE Assessor Training – We can train key members of your staff to carry out in-house DSE Assessments. Online DSE Assessment Tool – We’ve developed an online DSE assessment tool, ideal for remotely assessing from 10 to 10,000 employees. On-site DSE Workstation Safety Assessment – Our expert DSE Assessors visit your workplace to carry out detailed DSE Assessments on your employees. Workstation Safety Consultancy services – Both on-site and off-site DSE consultancy and training solutions, delivered by our expert team of DSE Assessor Trainers. Our services are tailored for suit your exact requirements, equipment and work environment.